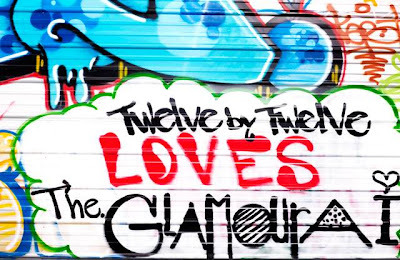 have you heard of the style blogger named the glamourai? she's a fashionable gal named kelly framel, who posts pix of herself wearing cute outfits. she's also an accessories designer, making mostly statement necklaces and big rings. check out her blog, cute outfits, and jewelry collection here. Gives us a little behind-the-scenes insight on how the outfits were chosen. When I arrived on set, the Twelve by Twelve team had already put together a few looks inspired by my own 'Mixology' posts. It was so fun to see their interpretation of my style! After going through the clothes together, they let me tweak the looks and style up a few of my own. Occasionally, I threw in my own accessories, but for the most part it was all Twelve by Twelve goodness. What was the concept and how did it involve your personal style? The concept for the shoot was my style but exaggerated, so every ensemble had a bit too much of everything (in the best possible way!). We couldn't just use one necklace or one bracelet—it had to be at least three or five! That was actually a good challenge for me and I loved taking my style to a more extreme place. What did you think of the hair and makeup? The hair and makeup definitely pulled it all together. I loved the finger waves they put in my hair; I wish I could style my coif that way every day! What are you most excited for from the new Twelve by Twelve collection? I'll be checking the website every day until the safety pin print silk t-shirt and the beaded petal blouse arrive!